Showcase your espresso brewing skills with the EC PRO and its bottomless filter. A bottomless filter produces a shot of espresso with a thicker, richer crema because the coffee has less contact with the portafilter. The filter also preserves the natural coffee oils to make a tastier brew. While using a bottomless filter requires a little more skill, we’ve got some tips to help you with your technique so you can brew barista-style. Use a burr grinder to ensure consistency of ground coffee. The right grind size depends on the type of coffee bean; adjust grind size as necessary. Always start the process of extracting with a clean, dry portafilter basket. Even distribution of coffee grounds is critical to avoid uneven extraction. Fill portafilter so it is slightly overflowing and use fingers to evenly distribute grounds and level. An even tamp means an even extraction. Rest the flat section of the bottomless filter on the side of a countertop to level the filter when tamping for even distribution. 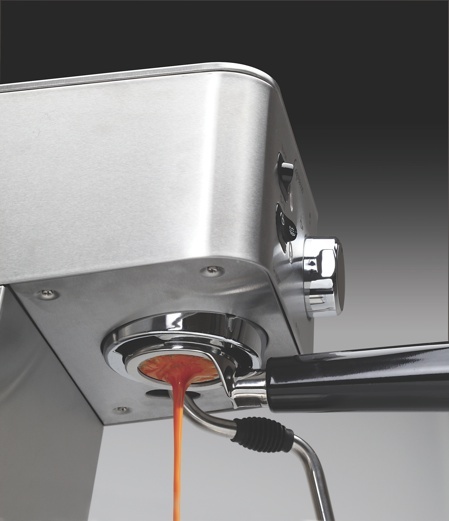 Aim for a 20-30 second extraction and adjust the time of the brew by changing the grind size. For a faster brew, use a coarser grind. For a slower brew, use a finer grind. For more tips and information about using the EC PRO’s bottomless filter, visit Capresso.com.